Another fire has broken out in Southern California, in addition to the two immense wildfires already being fought by crews on both ends of the state. The fires have resulted in at least 31 deaths, and 228 people remain unaccounted for. At the same time, many people on the east coast are still struggling to recover from recent hurricanes. Dealing with a natural disaster can be an overwhelming task, and victims often don’t know which way to turn. Cajun Navy Foundation, in its efforts to find ways to help people recover, has developed and become a voice for CrowdRelief. CrowdRelief is a community aid platform that can help connect people with the resources they need. The objective is to bring nonprofits, corporations and citizen volunteers together to rebuild homes and lives. Through the use of customized apps, CrowdRelief seeks to bridge the information gap for victims of disasters at each stage of the recovery process. Whether preparing to evacuate, seeking shelter, transitioning to temporary housing, seeking assistance with cleanup, remediation or rebuilding, CrowdRelief can help link families with the individuals and entities that can offer the help they need when they need it. Those affected by a disaster are encouraged to register their homes with CrowdRelief early in the recovery process. Through Crowdbuying, donors can transparently purchase household items and have them sent directly to the people who need them instead of donating money to an organization. Sharing your road to recovery can also keep family and friends engaged in helping you along. CrowdRelief can facilitate collaborative home rebuilding by connecting nonprofits and volunteers so that they can track and share resources and schedules. Throughout the rebuilding stage, volunteers become storytellers as they capture and share photos and videos of the work they are doing. Disaster needs maps are another feature of the citizen-led platform. Locally sourced necessities can be located on a map, along with the closest contact person in that area that can help meet the immediate need. A live activity feed is automatically updated to engage the public and reflect measurable progress. 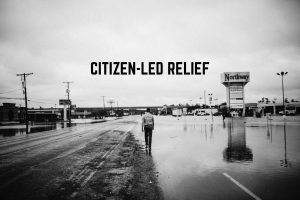 CrowdRelief offers an efficient way for good citizens to come together to rebuild lives after disasters. To register your home, send or donate supplies, request supplies or to request assistance, please visit www.crowdrelief.net/CampFire.